Praying DOES NOT cleanse from sin. Joining a church DOES NOT cleanse from sin. Living a good life DOES NOT cleanse from sin. Being baptized in water DOES NOT cleanse from sin. Partaking of the sacraments DOES NOT cleanse from sin. Committing your life to Jesus DOES NOT cleanse from sin. THE BLOOD OF JESUS — HIS BLOOD ALONE — cleanses from sin! Sin pays singular wages: DEATH! Christ died for our sins "according to the Scriptures" (1st Corinthians 15:3). The only way to have your sins forgiven (and your name written in the Lamb's Book of Life) is by the precious blood of Christ Jesus. How do you receive God's gift of eternal life? In fact, you don't even have to “ask” God to forgive your sins, because Jesus has already paid for them, so all you have to do is receive forgiveness as a free gift. No self-righteous works are required to be saved. In fact, adding anything to faith alone in Christ is no faith at all. Do not add or subtract from the gospel. We are saved by grace alone, through faith alone, in Christ alone, plus or minus NOTHING! You may have all sorts of questions, doubts, worries and fears, and that's ok, just so long as you place what faith you DO have in the Savior. It's normal to have some doubts. Just Enough Faith (faith is not the absence of doubt; but rather, the presence of believing). Even if you only have as much faith as a small seed the Bible says, that's ok, just so long as it's enough faith for you to believe on Jesus Christ to save your soul from sin and Hell (Romans 10:13). God does not require a degree of faith to be saved; no, rather, He just requires faith. Optimism is not faith. Saying you believe is not faith. I like to use the illustration of a chair. I can say all day that I believe a chair will support my weight if I stand on it, but I haven't placed my trust in that chair until I actually stand upon it. Once I get up on the chair, even if I was 99% sure the chair WOULDN'T hold up, I have placed no less than 100% of my faith in that chair. Isn't that beautiful? That means I can still have 100% faith in Jesus Christ, even though I may still have 99% doubt in my heart. Faith is the presence of just enough trust to receive the gospel as full payment for my sins. If you've placed your hope in Christ's death, burial and resurrection, then you are saved. Hoping for the best is not faith. Faith is when you come as a sinner in need of a Savior, and you actively place your trust upon Jesus Christ to forgive and save you, because of the blood that He shed for you. Christ died, that's history; Christ died for my sins on the cross and raised up, that's salvation! There is a sincere but dangerous group of false teachers who propagate a heresy known as, Lordship Salvation. This is the errant philosophy that believing on Jesus is insufficient to save anyone. Lordship Salvationists ADD to the gospel. They add a requirement for people to leave the act of sin, forsake the sinful world and cease from sinful bad habits to be saved. They require a person to commit to changing their sinful ways (reform) as a prerequisite to placing their faith in Christ to be born again (regeneration). Biblically, it's the other way around, that is, regeneration comes first and then reformation. It is a satanic lie to teach that a person must reform before they can be regenerated by the Spirit of God. Did you ever wonder why Dr. John MacArthur and his followers don't teach the importance and necessity of Jesus' literal, physical, blood? The doctrine of the blood of Jesus totally blows up the heresy of Lordship Salvation. It's Christ's literal, physical, precious, blood that washes our sins away, and not our commitment to cleanse our own ways and turn over a new leaf as they say. In the Old Testament, God required the high priest to kill a male lamb, a perfect lamb without blemish (which pictured Christ), and to apply the lamb's blood to the mercy seat in the holy place. The holy place was in the innermost court of the tabernacle. There was no stipulation or requirement in the Old Testament that the Israelites cease from sinful bad habits in order for the lamb's blood on the mercy seat in the holy place to be valid! When the Lord brought the 10th plague upon Egypt, the firstborn died. The only way to protect the firstborn was to kill a lamb and apply it's physical, literal, blood to the homes doorpost. It wasn't enough for the lamb to be killed. The blood had to be applied! The Lord said in Exodus 12:13, “WHEN I SEE THE BLOOD, I WILL PASS OVER YOU”!!! It is the BLOOD that saves, not the death! It is Jesus' blood that saves, not the death only as John MacArthur errantly teaches! The people weren't required to give up their sins before the high priest entered into the holy place. In fact, it was because of their sins that the high priest needed to apply the lamb's blood in the holy place. How ridiculous it is for anyone today to claim that sin must be forsaken in order to come to Christ for salvation. The entire purpose of the Old Testament holy place and sacrifice of the innocent lamb, and application of its blood to the mercy seat in the holy place was to atone (cover) for the sins of the people for that year. It was BECAUSE OF THEIR SINS that the blood needed to be applied! The people weren't required to reform themselves, or cleanse themselves, as a prerequisite to the priest applying the blood. If we look even casually at the meaning and purpose of the work of the Old Testament high priest, it plainly exposes the heresy of Lordship Salvation. No one in the Old Testament was required to declare “Jesus is Lord” to be saved; but rather, their faith in the Lord was COUNTED for righteousness (Genesis 15:6). When Adam and Eve sinned, Adam went and gathered fig leafs, sewing them together to make clothing in an attempt to cover their nakedness. But God immediately rejected Adam's fig-leaf religion. Instead, God killed an innocent animal, shedding its blood to provide skins of clothing for Adam and Eve. The innocent animal represented the coming Messiah Who would one day bleed and die for OUR SINS, giving His precious blood to wash our sins away for ever. It was the BLOOD that atoned for sin! From Genesis to Revelation, the Bible proclaims the necessity and importance of Jesus' literal, physical, precious, blood that cleanses away our sins! 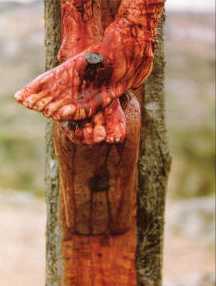 Thank you Lord for washing my sins away with your blood!